Mau Son To urist Area located around 30 kilometers east of Lang Son City on National Road No. 4B and stretching over the three communes of Cong Son, Mau Son in Cao Loc District and Mau Son in Loc Binh District is a fascinating world for those who love discovering wild life and stunning sceneries. Covering an area of more than 10,000 hectares, Mau Son is endowed with 80 mountains of varied sizes, with Cha Mountain at a height of 1,541 meters and Me Mountain at 1,520 meters the highest. Due to its location 1,200 to 1,300 meters above sea level, Mau Son has a temperate climate and the average temperature is 15 degrees Celsius so it is really cool in summer and very cold in winter. Mau Son is attractive with magnificent landscapes formed by streams, a biodiverse system and more than 1,500 hectares of primeval forest which is home to many precious flora and fauna species. These advantagious conditions are perfect for ecotourism development. Together with romantic landscapes, Mau Son also accommodates the ancient cultures of the ethnic peoples of Dao, Tay and Nung. Visitors to Mau Son have an opportunity to enjoy the wonderful landscapes, fresh atmosphere and learn about local traditions and culture by joining in the daily life of some ethnic minority groups. Thanks to the favorable climate, Mau Son can offer tourists several specialties such as peach, Che Tuyet tea and Mau Son wine, which is processed using Mau Son’s plants and water sources from the mountain. 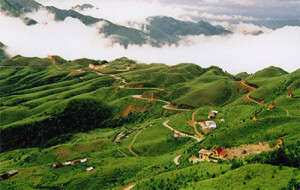 To preserve and develop natural, cultural as well as historical relics in Mau Son, local authorities have called on local residents and related companies and organizations to protect traditional locations such as Phat Chi Mountain and Mau Son genie area, the offering rituals of Dao ethnic people and traditional houses of ethnic groups. Phat Chi is a recommended venue for pilgrims as it is dedicated to worship the genies of Dao minority group. The mountain enchants with its peace and tranquility and primitiveness with wild forest and evergreen fields. Lying between Cha Mountain and Me Mountain in Lap Pia Hamlet, Mau Son genie land has many ancient temples and stone tombs, religious relics and boasts the enriched culture of ancient Tay people.